Coverage of events at Galerie CO and in the design community in Montreal, across Canada, and around the world. 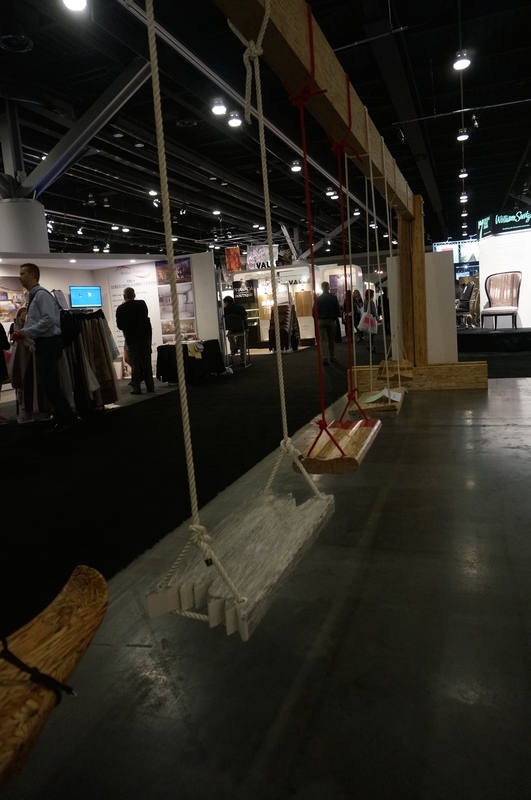 Last year we were deeply embedded in Toronto’s Interior Design Week, as part of Studio North at The Interior Design Show. This year, we’re visiting the parallel and definitely more alternative Toronto Design Offsite (TODO) Festival that runs from January 19 to 25. The annual event is a platform to showcase prototypes and installations that celebrate the diversity of Canada’s energetic design scene and as such it provides vital exposure to some of the country’s most promising designers while introducing the public to the practice of design. Toronto native Lee-Anne Bigwood, loves noticing, observing and participating in the arts scene in her city. So it’s not surprising that she offered to visit part of this year’s TODO Festival and report back on items and exhibits that might be of interest to us and to you! Her post covers a Festival favourite — Come Up To My Room (CUTMR) — which returns for its 12th consecutive year at Toronto’s Gladstone Hotel. Let’s just talk about the venue itself for a minute because the Gladstone Hotel on Queen Street West is a thing of beauty. Designed by George Miller, the architectural style is characterized by the rough cut stone and brick and by the dramatic arches over the windows and porch entrances. 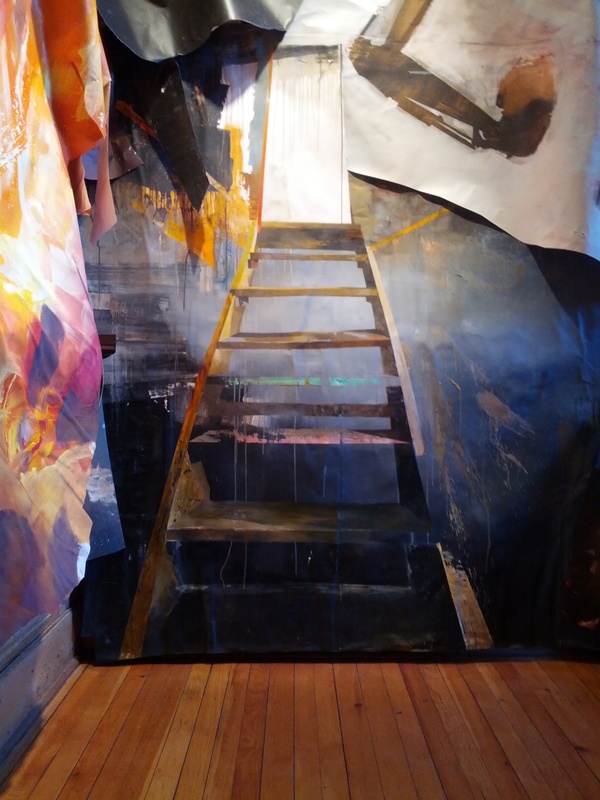 Using the original 19th century Victorian architecture, exposed brick walls and high ceilings, local Canadian artists have come together to transform the Gladstone’s 37 hotel rooms into experimental, alternative works of art. Since each bookable hotel room in the historic, 125 year old building represents a different artist’s vision, and it is also an event and cultural space, hosting awards, literary projects, social change events, live comedy, and music; no two visits will be the same. If you go, take the time to admire the charming architectural details. One of the first things you notice after you move past the beautiful welcome desk in the front lobby, where they guide you to start your way up the grand stairway towards the entrance to the festival, is that you’re circling around an ornate, meticulously restored Victorian elevator. It’s one of the last hand-operated elevators in Toronto. If you get a chance to ride it, it feels like you’re taking a trip back in time. The incredibly friendly operator tells me that it still requires electricity, but that it is mostly manually operated. Also in that magnificent stairway up to the exhibit is the gloriously lush living wall and industrial style lighting fixtures, enhanced and elevated during the Festival by a towering collage that extends up to the top floor. Titled ‘Ascent‘ by artist Phil Irish, the collage is comprised of many large, richly decorated pieces of thick kraft paper, depicting rugged painted images of mountains and pipelines, which are chopped and reconfigured. The sublime peaks are inspired by The Banff Centre, a globally respected arts, cultural and educational institution, and the references to peak oil were inspired by Alberta’s oil sands, which the artist explains evokes the struggle of both societal and personal transformation. 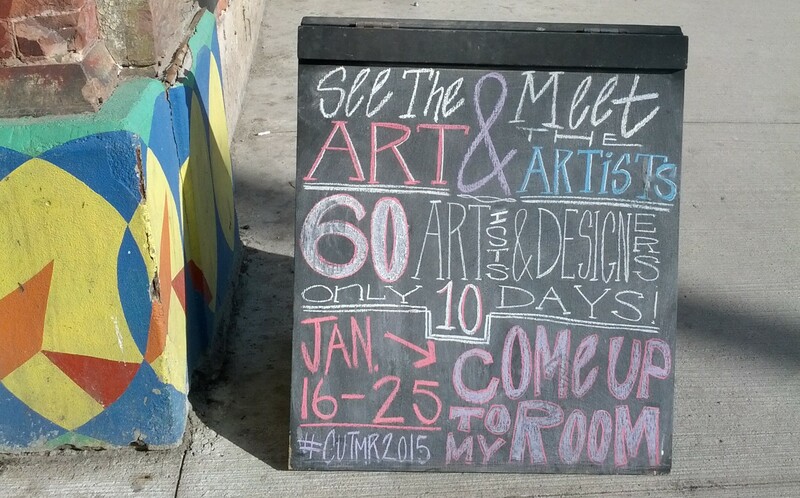 CUTMR2015 turns the Gladstone Hotel into an incredible art-filled space covering all of its four floors. Although the hotel is already a destination for lovers of art and culture, during the Festival it becomes even more infused with art and welcomes even more people into its already very inclusive space. So much so, that several signs throughout the hotel remind visitors that some of the rooms, though they are certainly artfully decorated, are not part of the CUTMR program. Throughout the exhibit various signs are installed, as well as some text art for the keen observer. This expansive installation called ‘Innerventions’ by Denise St. Marie and Timothy Walker, reminds us that signs don’t always have to be authoritative; sometimes they can invite viewers to take a lighter look at their regular activities. These signs are concentrated in the hotel, but as a resident or visitor in Toronto, you may be lucky enough to see some of their work peppered throughout the city. On the second floor, one of the first large exhibits you’ll come across is ‘Common Thread’, a project created by Sander Freedman, Riyad Bacchus and Andrey Chernykh, celebrating culture, nature and design. It’s inspired by a carpet designers’ story of historical carpet design and craftsmanship in Nepal, India and Iran, and its desire to make a historically polluting and petro-chemical-heavy process more sustainable and environmentally friendly. For me, what was so striking about the exhibit was the reminder of how many spools of rich string might make up a single carpet. Seeing the unravelled material up close, it was exciting to imagine what a factory for such a process might look like. The installation expands over a whole hallway, with some strands of the string starting on the ground, and travelling up over doorways and into the arches. 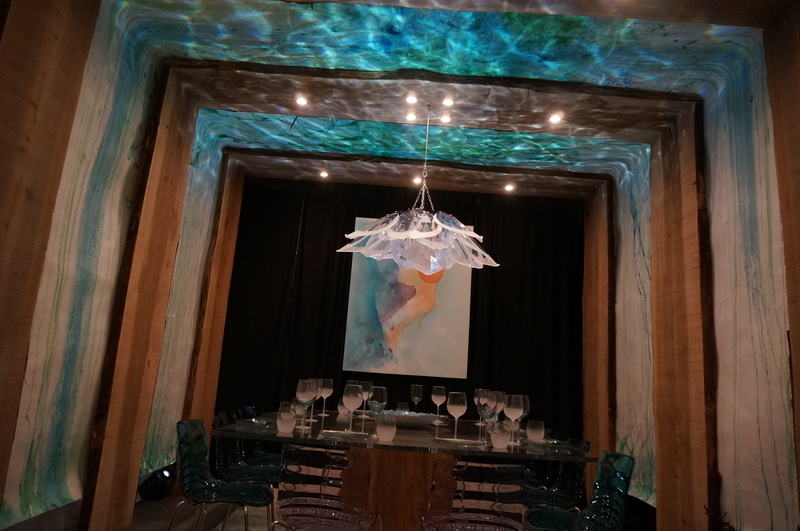 I enjoyed how they incorporated this installation right into the already existing sitting area on this floor; it was a reminder of how the hotel really celebrates the interaction between artistic impression and regular day-to-day business. The sort of common items you would normally find in your hotel hallway, such as water pipes, safety equipment and electricity cabinets, which you would normally gloss over and ignore on route to brunch, are instead framed and highlighted. These are part of a group exhibition on the 4th floor, curated by Carla Poirier and called ‘in a space.’ It’s an exploration of physical composition through the lens of Graphic Design. The artists evaluate the fundamentals of design, and invite the viewer inside an abstract realm of ephemera and merge the line between art and design. It seems as though their contrasting use of black and white decoration and imagery play on their placement within the hotel and the sorts of shadows and lines that normally exist. There’s a frisky nod to how such common objects as brooms and drying racks can, in this context, be interpreted as ‘art’… or not. I tried to capture the real cleaning supplies being used alongside their elevated parallels. An exhibit, located on the main floor in the Melody Bar, reminds me of the Galerie CO designer we showcased in this post, where we explored the idea that we are creating entirely too much permanent waste from plastic. 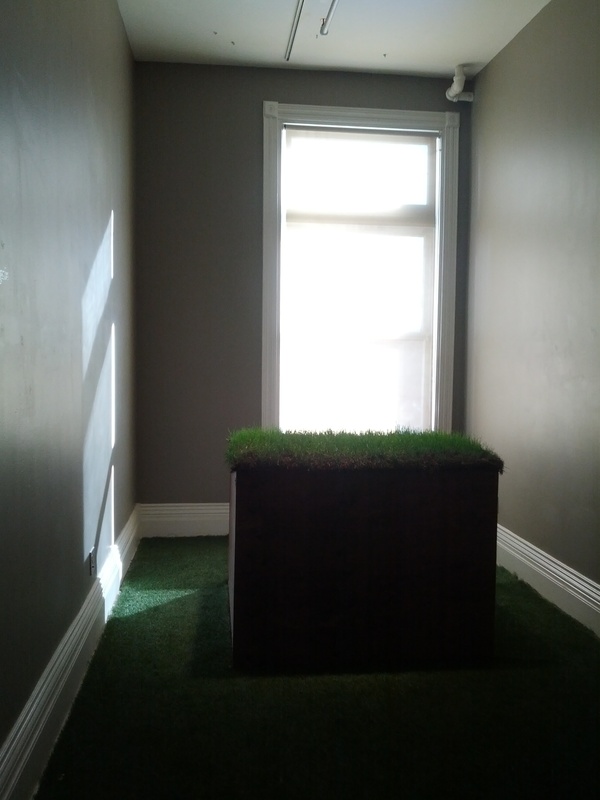 Called ‘Oh Thank Heaven’ the installation was created by Miles Ingrassia and Iris Karuna. While normally the colourful plastic pop bottles are stacked with their black crates, in this exhibit, they’re separated and installed in such a way that they resemble a church altar and stained glass windows. The artists explain that the installation explores urban detachment and the compulsion to discover or designate unconventional spaces as sacred. These photos and selections are just a small portion of an expansive and affecting exhibition, which runs until January 25th, with their closing party happening Saturday Night. Tell us what you think of the installations in the comments below, or on our Facebook page, or on Instagram or Twitter @galerieco. 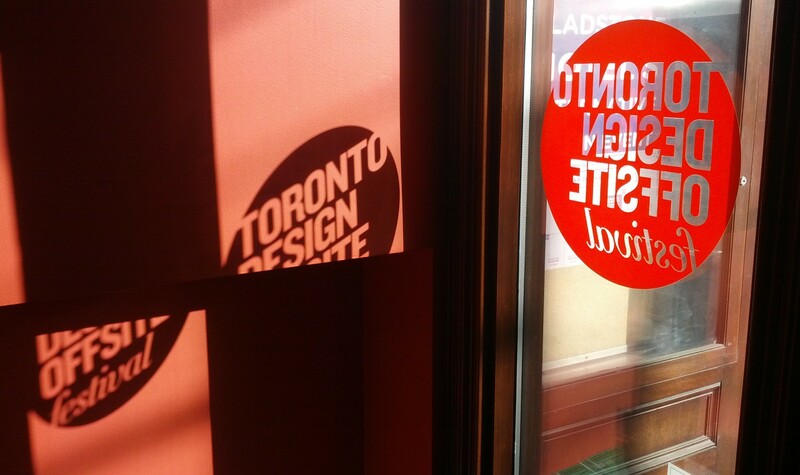 You can follow Lee-Anne’s adventures through Toronto Design Week, via her Instagram account, @littlebitesbig. We’re still on the West coast with the blog! 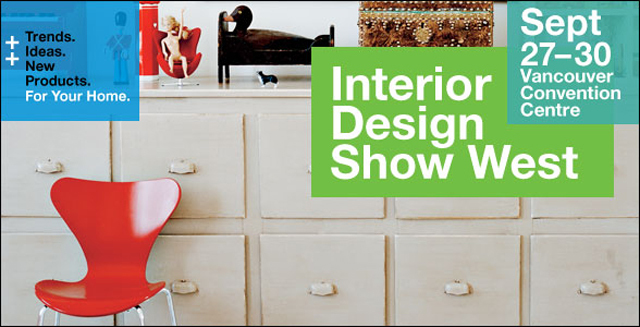 Last weekend was the annual Canadian Interior Design Show (IDS) West in Vancouver. I’m lucky to have a great sister-in-law in Vancouver, Lynda Prince, who loves poking around design shows as much as I do and she volunteered to check it out and report back on items that she loved and that she thought reflected a “CO sensibility” and would be of interest to our readers. Each year, IDS West gets a little more grown up. Seven years ago, when we were in the middle of a frenzied renovation, my husband and I went to the IDS for inspiration. At the time, the show was fairly institutional. We saw the latest in dishwasher design and sleek Italian mosaic tiles; but there were only a few local designers and nothing that I hadn’t seen at the many tile and appliance stores that had become something of a second home during our year-long reno. 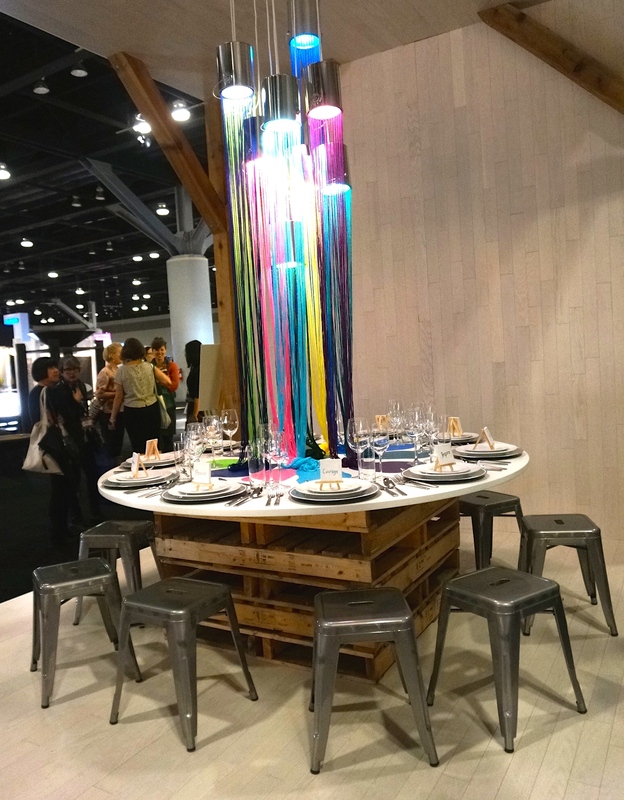 This year, IDS West had a much more exciting and unique vibe. 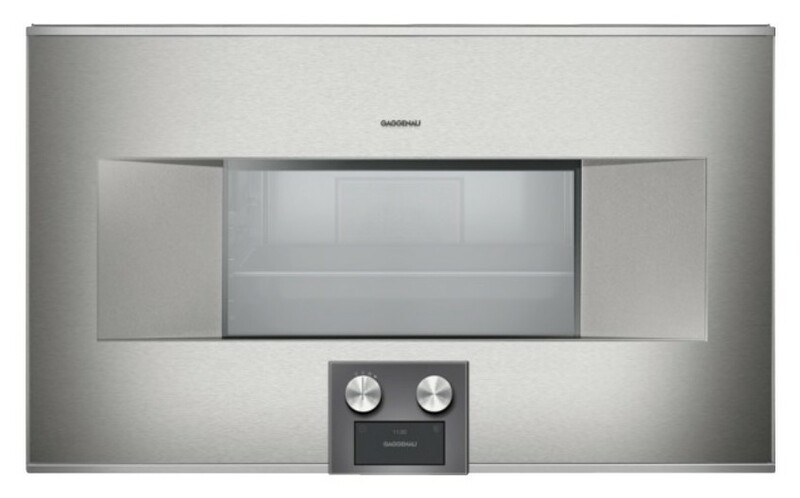 Granted, there were still the gloriously manicured tiles and elegant appliances (like the Gaggenau micro 24 inch steamer wall ovens); but there was also a huge boom in custom and one-of-a-kind works. Mirroring the expansion of a more customized product, were a series of talks given by international designers and architects on the new meaning of luxury. To paraphrase, today’s client is sophisticated about design and is taking a more responsible role in decision making. Trends are towards more bespoke work. 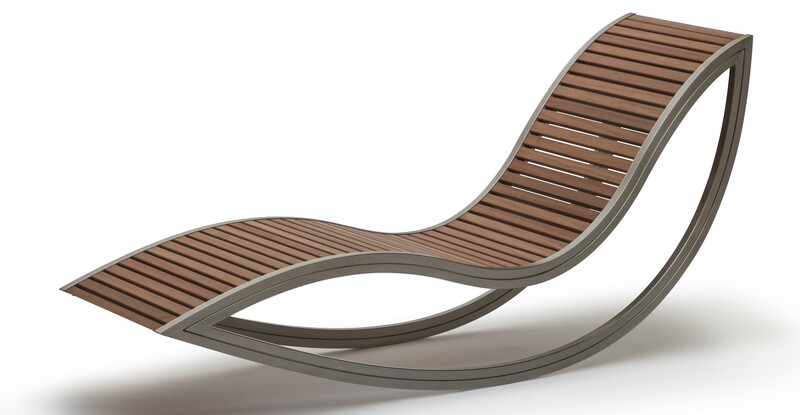 Luxury in this new view is defined as quality that integrates responsible design and often sustainable practices. Designers producing custom pieces were presented in pockets throughout the show. 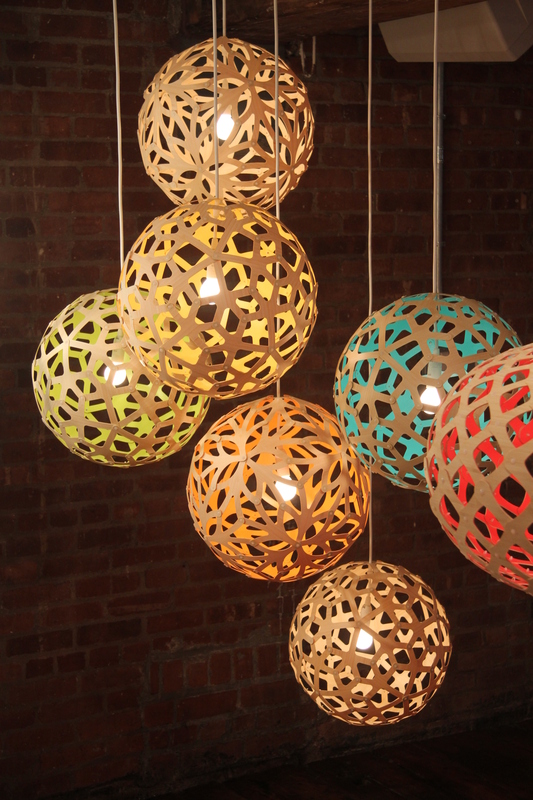 To this end, the fabulous lighting collection Spheres, designed by Matthew McCormick Design Inc., in collaboration with Marie Khouri, was extraordinary. 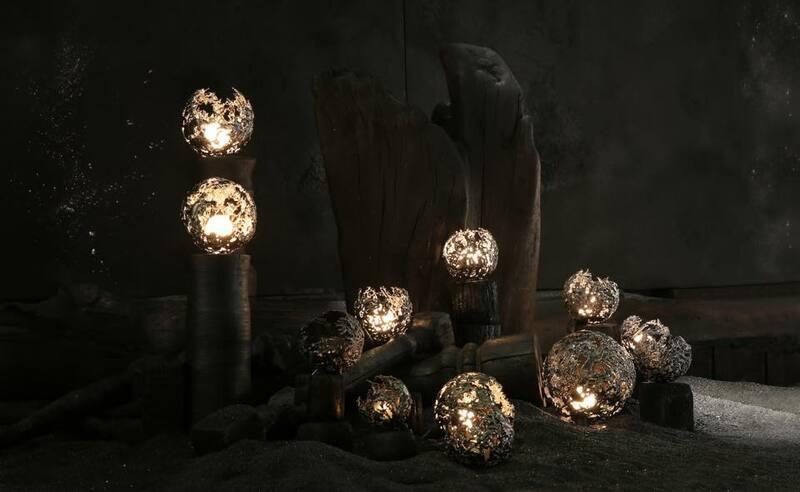 Their limited edition run of bronze and pewter sculpted lights led me into a moment’s fantasy of my completely reworked living room showcasing these stunning lights. An area where one-of-a-kind and limited edition were part of the standard language was in one of my favourite sections of the show: Studio North. I couldn’t help but notice the predominance of black walnut pieces—apparently sustainably harvested—that littered this section; all interesting and uber mid-century inspired. 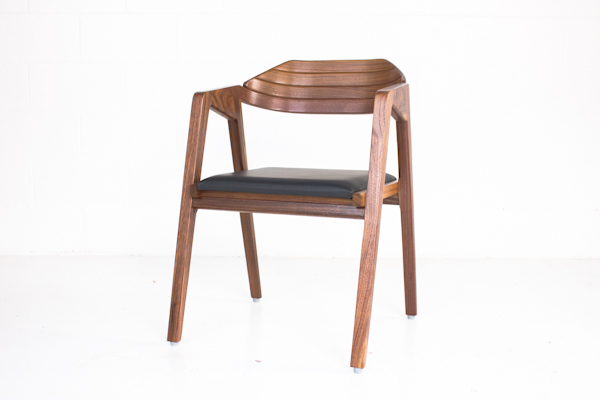 Highlights came first at Vancouver’s Gamla, a design group showcasing sleek pieces including their S2 Dining Chair a, here it is, sustainably sourced black walnut modernist chair. This summer, it was selected as a feature chair in the London Chancery Project, which means that an order of these chairs will soon be housed in the newly expanded Canadian High Commission in London, England. 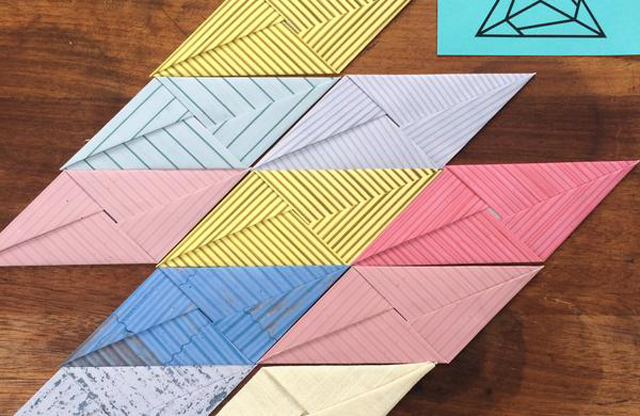 Another Studio North highlight was The Brooklyn Exchange, curated by Port and Quarter (a design group out of Vancouver) and composed of a consortium of independent Brooklyn-based designers. My eye fell on the M Lamp, by David Irwin of Juniper Designs. The LED light is operated by a rechargeable battery (it can be recharged up to 2000 times with no degradation). 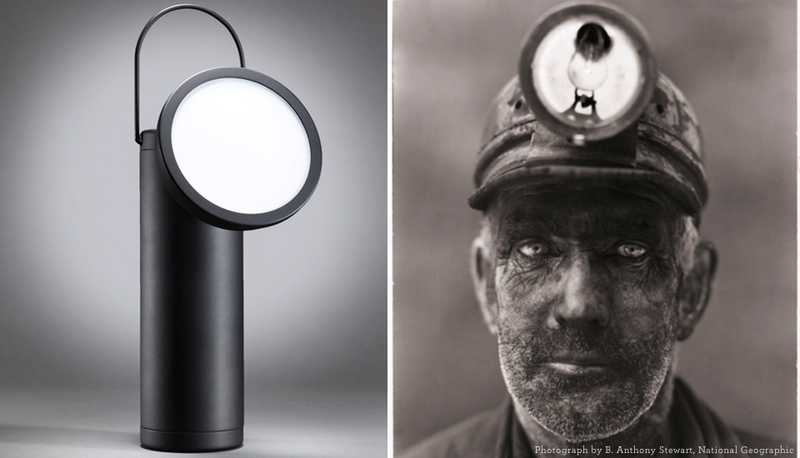 With a dimmer and a simple and elegant look (available in bold orange, sleek white and black), it’s a modern take on a 19th century industrial miner’s lamp. 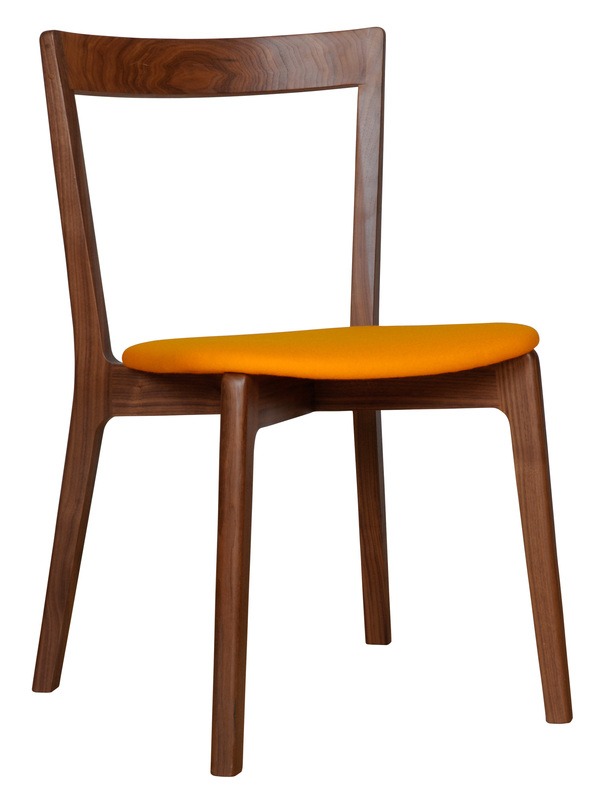 Irwin was also showing his Cross Side Chair, a sleek and stackable chair made from FSC-certified wood (guess, black walnut). The cushions are upholstered in renewable and compostable fabrics ranging from new wool to hemp blends. The interior of the cushion is made from 100 percent natural latex coming from rubber trees. One of my favourite products at IDS was something that costs under $50 (it’s even cheaper if you have a 3d printer). 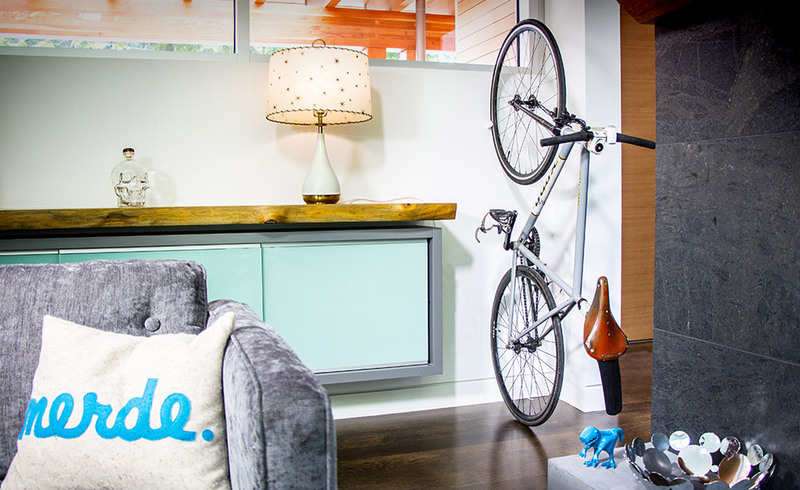 It’s called CLUG and is the world’s smallest bike rack. It’s a simple wall-mount clip that fits in a 2″x2″ space. 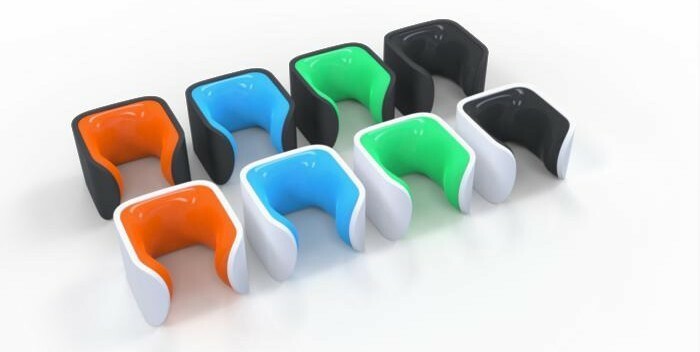 CLUG was designed by the trio at Vancouver’s Hurdler Studios, an industrial design studio and crowdfunded by Kickstarter. 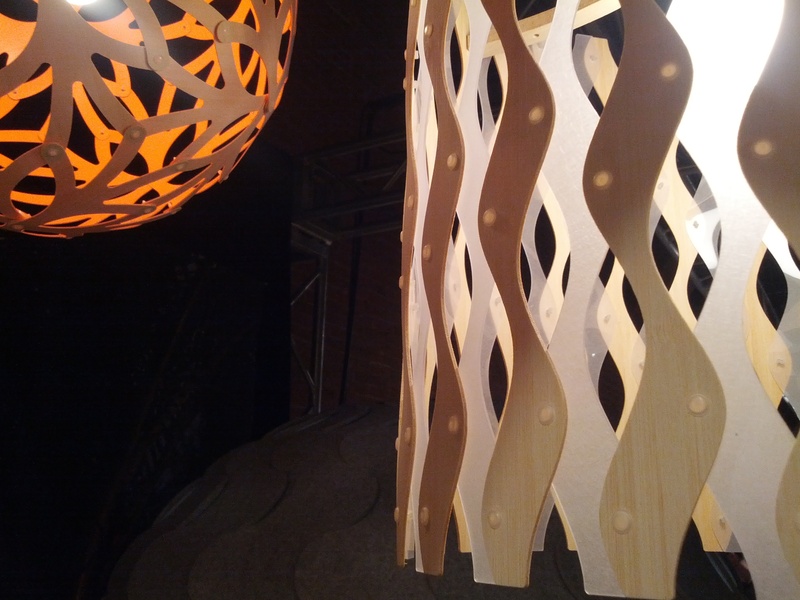 Another fun area at IDS West was The District; less interior design and more a sneak peak at one-of-a-kind merchandise. 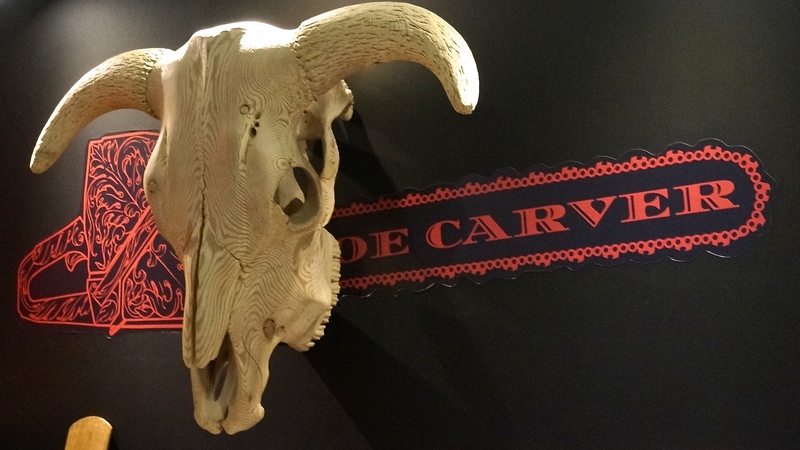 Booth hopping was a kick…admiring wares like heyday design’s milk jugs, hand-spun wool knit blankets from Natural Wool Knits, dock kits made out of Canadian Mint money bags and Joe Carver’s awesome wood sculpture of a bull’s head. Finally on a more macro level, there was a large area showcasing local designers. 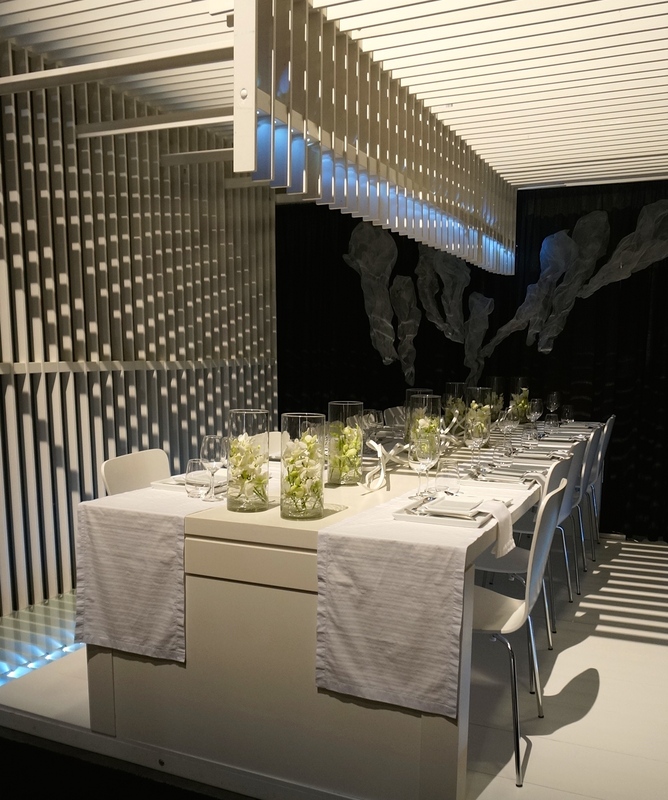 Ten booths had been transformed by ten different designers each creating a spectacular dining scene. These extraordinary dining environments—from the lavish and romantic to the outrageous and whimsical—were wonderful. This is what the show should be doing more of (albeit an ‘Ikeaesque’ merchandising approach), showcasing designers doing their thing often using local materials. I spent much of the show in this crowded area picking up on design trends, loving the variety of ideas from a deep talent pool of designers, and getting names for our next reno project! Thank you, Lynda, for sharing a slice of IDS(West)! As our regulars know, I am partial to British design. I spent many of my formative years living in London and picked up an enthusiastic appreciation of the English sensibility in design, among other things! I get back quite a bit and a couple of years ago I went over for the annual London Design Festival. What a blast that was! The city full of interesting installations, exhibitions and pop-up shops, showcasing the best of British design. 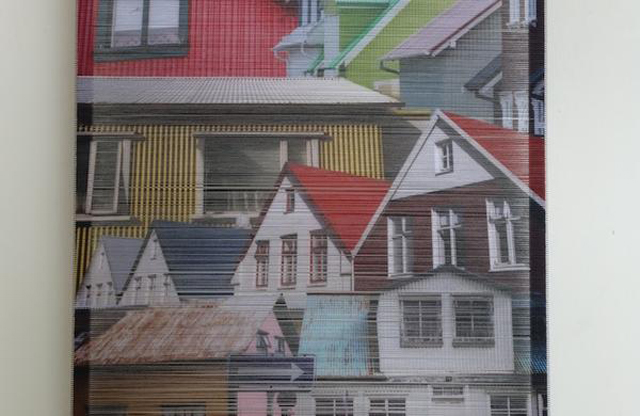 It was quirky, colourful, off-the-wall and I loved every minute of it. This year the Festival runs from the 13 to 21 of September and I’m not in London, I’m in Montreal. But I will be following what’s going on and reporting back. In the meantime, if you’re lucky enough to be travelling across the pond this week, have a look at what some of CO’s British suppliers are doing for the Festival, and go visit them and say hello, if you can! For the duration of the Festival, Donna Wilson will be operating a week-long installation and Pop-Up shop in London’s Shoreditch neighbourhood (BOXPARK / Unit 26, 2-10 Bethnal Green Road). 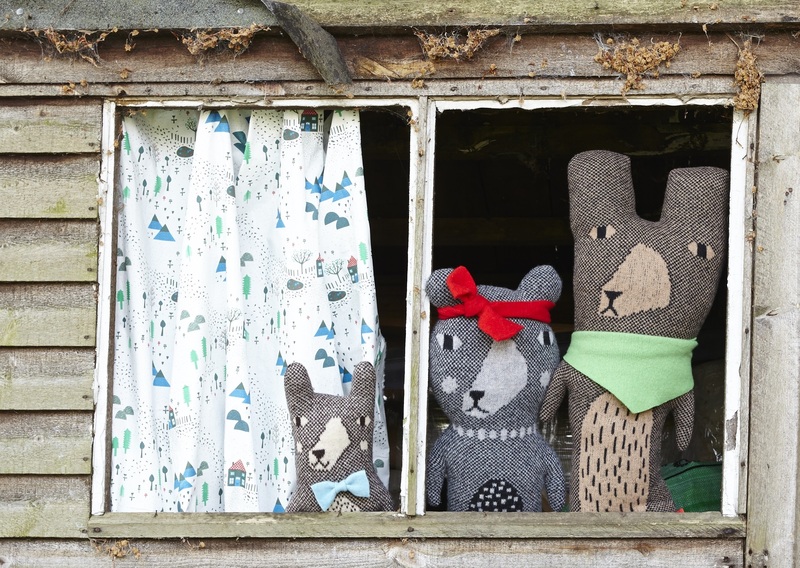 To create her Rainy Day Pop-Up Shop, she transformed a space into a Donna Wilson wonderland, featuring hundreds of soft raindrops, murals and panels showcasing her first collection of fabrics, a “selfie station,” knitted creatures everywhere, and limited edition products made especially for the Festival. Select products from Donna’s new autumn/winter collection will be available, along with classic pieces from her signature range. Look for her new collection this fall at Galerie CO.
Donna has also designed a series of woollen fruit for the lifestyle boutique SMUG, that will launch during the Festival. Ella Doran will participate in a collaborative live installation at the Victoria & Albert Museum during the London Design Festival 2014: “putting the circular economy into action with ‘huate design’ refurbished upholstered chairs”. The installation is in Gallery 99 and is built from several upholstered chairs that are deconstructed and refurbished in the V&A Design Studio. For the project, Ella teamed up with two London-based designers (Kyle McCallum and Avantika Agarwal) to create experimental fabrics. She created several designs from material that she collected on a recent trip to Iceland to tie together the look of the diverse chairs that feature in the installation at the V&A. 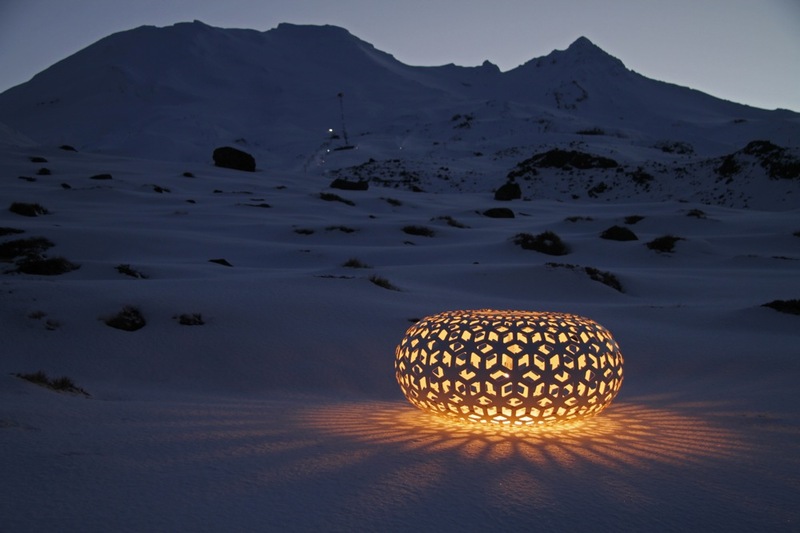 The installation is presented in conjunction with Galapagos Design and The Great Recovery (RSA). 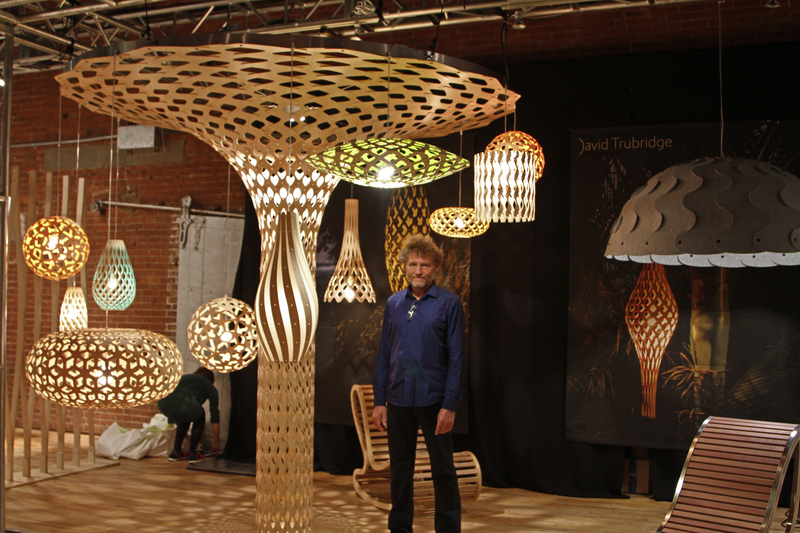 Establishd in 2012, and based on the insight that our linear ‘take-make-dispose’ model of manufacturing is throwing up major economic and environmental challenges, The Great Recovery aims to facilitate a shift toward more circular systems, and considers the design industry as pivotal to this process. 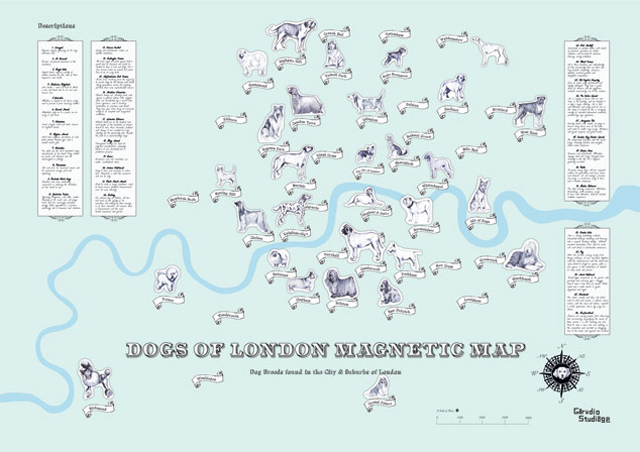 This year, for the London Design Festival, Garudio Studiage will exhibit their interactive magnetic map installation, “Dogs of London,” which explores the connection between Londoners and their dogs (Volte Face, 21 Great Ormond Street). 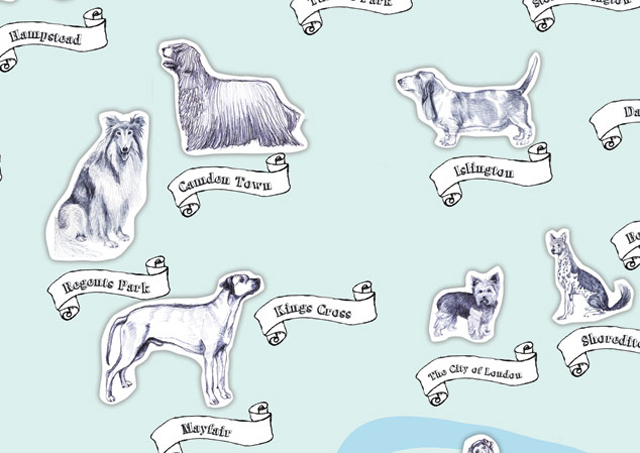 The moveable dog illustrations allow viewers to match their favourite areas and animals. Where do you think the crazy haired Chinese Crested, or the impeccably groomed Afghan Hound would live? 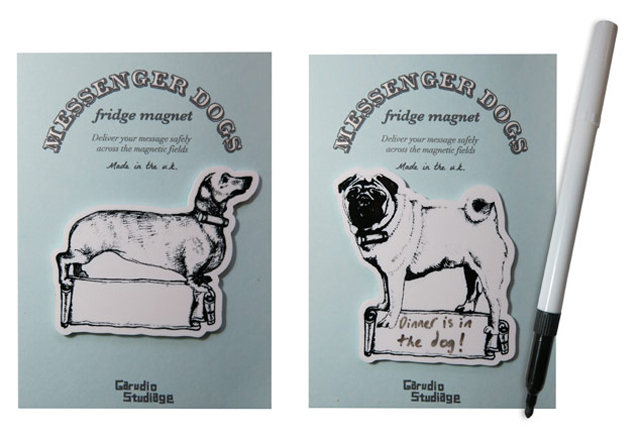 A new range of fridge magnets based on the dog illustrations from the map has also been launched so you can take your favourite dogs home. 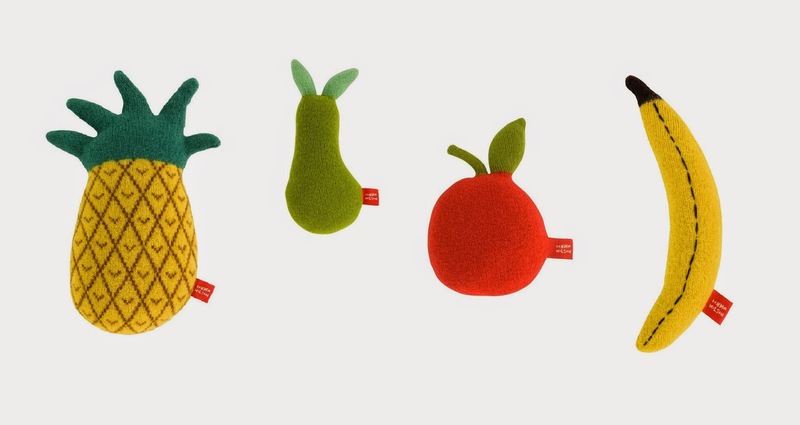 HAM will be part of designjunction. 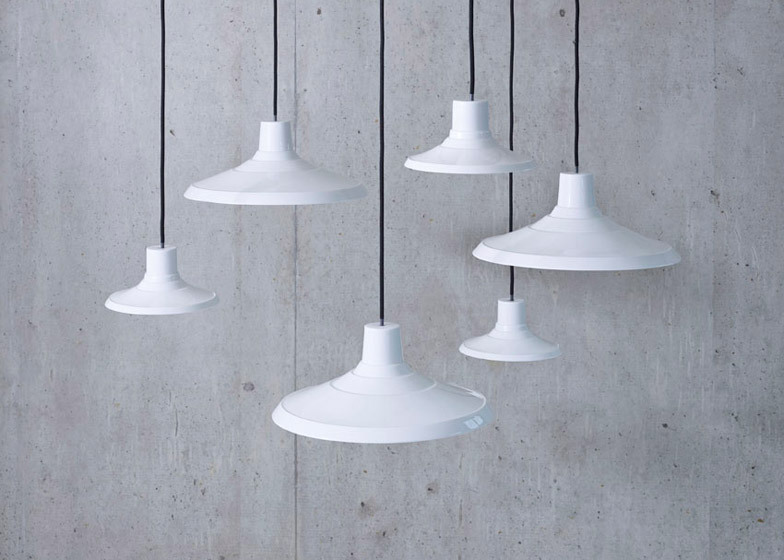 Designjunction is among London’s leading design destinations showcasing the very best in furniture, lighting and product design from around the world striking a balance between creative and commercial. 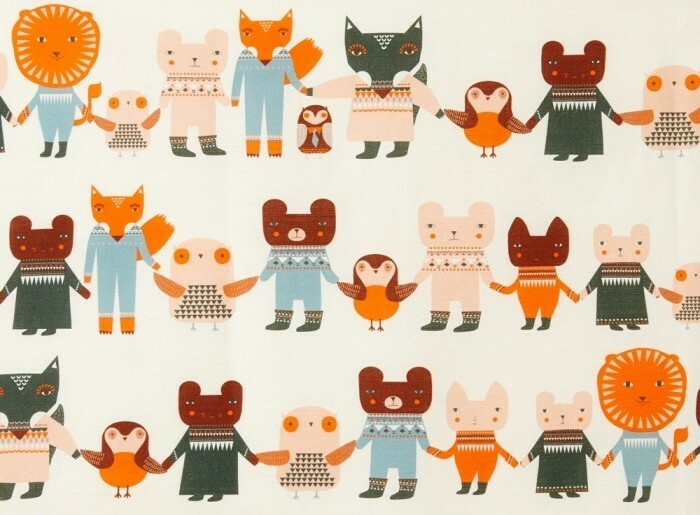 HAM will launch its latest collection of ceramics, along with new rabbit prints and cards. 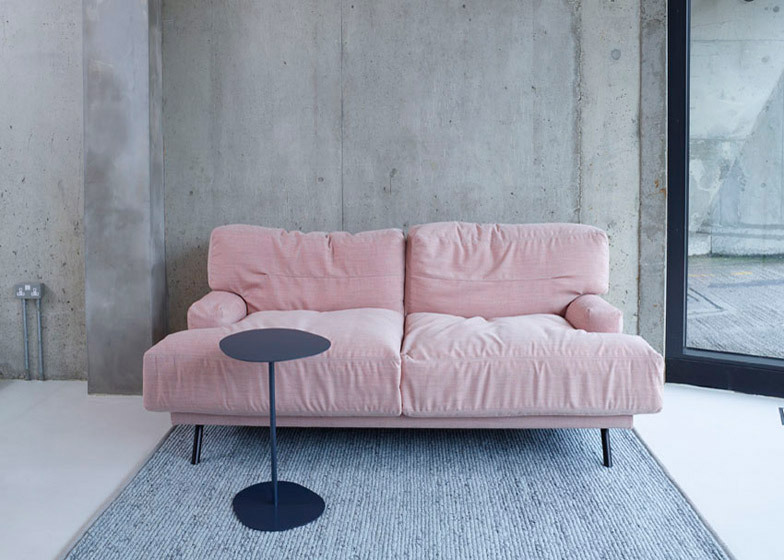 Designjunction takes over a centrally-located 1960s sorting office (21-31 New Oxford Street) and you can find HAM at stand G3 on the ground floor. You will be able to see (and purchase) a full selection of HAM’s new pieces at Galerie CO as of the end of September — including the mugs! During the Festival, SCP East (135-139 Curtain Road) plays host to “Simplified Beauty”, an exhibition of contemporary design, a celebration of things made as they should be. Co-curated by SCP founder Sheridan Coakley and British-Japanese designer Reiko Kaneko, the show features a blend of work from Japan, America and Britain, exploring how different cultures approach simplicity and beauty. A selection of Japanese products are showcased from the Ishinomaki Laboratory, the internationally acclaimed centre of ceramics, Mashiko, glassware from the Shotoku Glass Company (including the new Ando drinking glass designs by Jasper Morrison), a collection of everyday products by Sori Yanagi and a range of cleverly functioning kitchenware, tableware, utensils and cloths from Matsunoya and Metrocs. 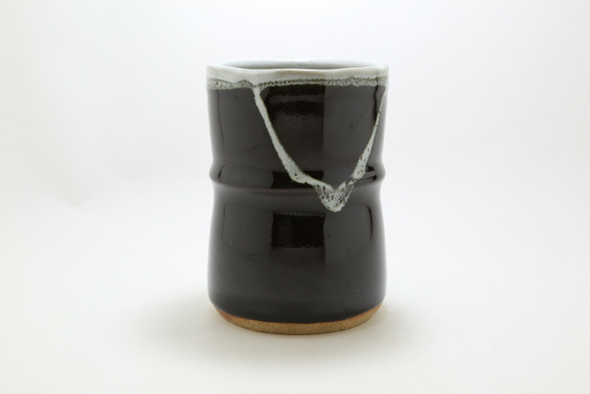 From the United States, the show includes a selection of furniture and objects from Brooklyn-based duo, Fort Standard. And SCP presents its own autumn/winter collection for 2014. 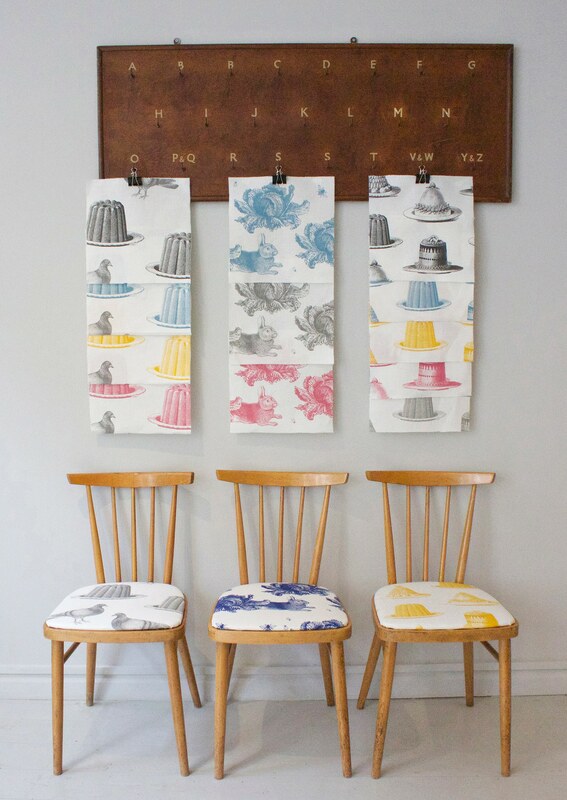 The talented duo of Juilet Thornback and Delia Peel are launching their new fabric colourways during the Design Festival. 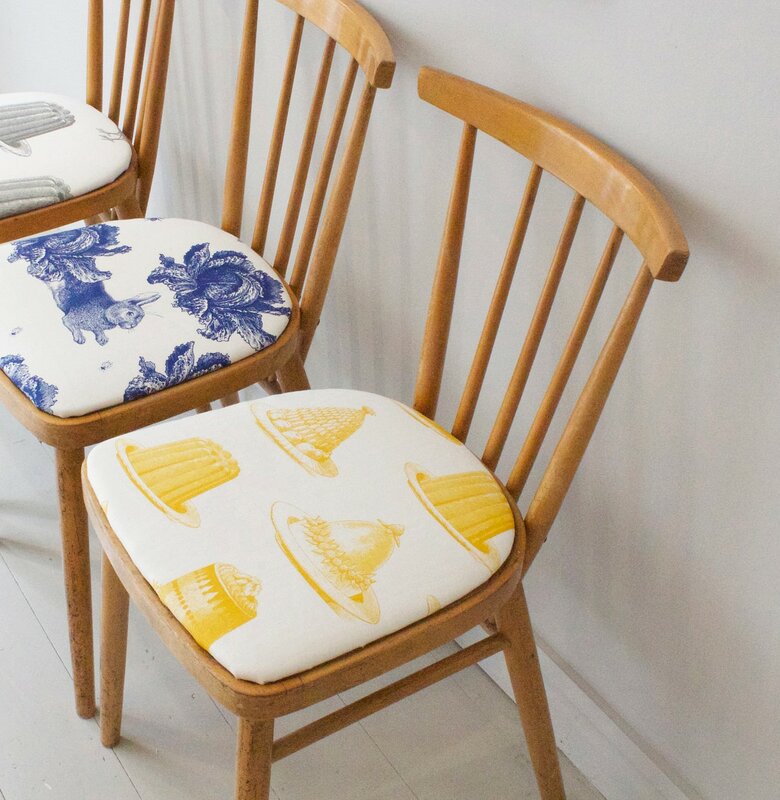 To celebrate, they are inviting visitors to drop into the shop in Bloomsbury (7 Rugby Street) to place a bid in a silent auction, for a chance to own a beautiful, vintage mid-century modern chair upholstered in the new fabric. The proceeds of the Silent Auction will be donated to Music as Therapy International, a UK registered charity which devises and delivers innovative, high-impact music therapy projects around the world.